Whiskers. A human can shave off his whiskers without a problem and look squeaky clean to boot! But if you shave off or trim a cat’s whiskers you could run into some problems. The cat is a physiological marvel. They have incredible attributes that enhance their athletic abilities and some of those abilities are made possible by the use of their whiskers! Don’t mistake the makeup of a cat’s whiskers and confuse them with human hairs. This is a common mistake but you can’t compare them because they’re just not the same! Unlike human hair, the cat’s whiskers perform a delicate function – they are a cat’s “touch receptors.” Another name for these long stiff hairs is “vibrissae.” These vibrissae are different from the shorter top fur coat of a cat because they’re embedded deeply into the cat’s skin and are connected to the cat’s sensitive muscular and nerve system. These act together to form a sort of radar which help a cat to respond to its surroundings with heightened sense of feeling. These tactile hairs of a cat is not only in either side of its nose but also above the eyes (albeit shorter) and on their jawline as well as on the back of their front legs. Now that’s a lot of whiskers! These Whiskers Are Not Made for Cutting! A cat’s whiskers cannot or should not be trimmed! Without their tactile hairs a cat will become disoriented and frightened (in effect, a scaredy cat!). Cats use their whiskers to make sense out of their environment. 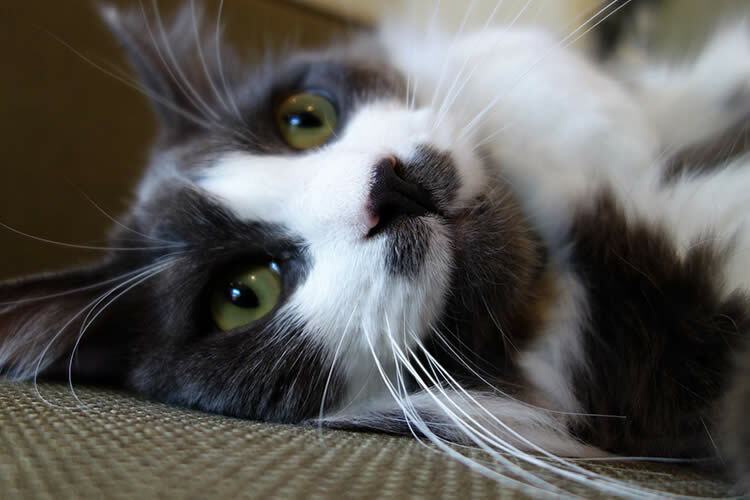 Whiskers allow them to feel where they are, somewhat like our sense of touch. Imagine yourself feeling your way around through the dark and you’ll grasp exactly how cat’s use their whiskers to accomplish the same task and thus aid them in avoiding subsequently painful situations! Cat’s whiskers (tactile hairs) will shed and grow back naturally, so keep those scissors away from them! There’s a sensory organ at the end of a cat’s whisker called a proprioceptor. The proprioceptor relays signals to the brain and nervous system and is related to the position of the cat’s body and limbs. In essence, the cat knows exactly where every part of its body is at every second for split second decision making! The next quick movement could save a cat’s life! The proprioceptor is so sensitive in fact, that it detects even the smallest changes in the cat’s environment! So the cat’s whiskers cannot only gauge whether it can fit blindly into a tight space like a contortionist but can also aid the cat while chasing prey by reacting to certain vibrations in the air! It’s interesting to note here that a cat, unlike the human, has no true collar bone, which also aids them in twisting and turning themselves into those tight areas. With their whiskers cats can even visually measure distance, allowing them to leap out of harms way in an instant! Pretty cool, eh? The cat certainly is an amazing animal! Cat’s are difficult to read but if you observe their whiskers you can certainly decipher their moods…most of the time. For instance, when a cat is at rest its whiskers are immobile but whiskers bunching up flat against the cat’s face could mean the cat is scared. When at play in pursuit of a toy, the cat’s whiskers may be pointing forward, thus signifying your cat is in hunting or pursuit mode. Whiskers pushed forward but more relaxed means a cat is happy, curious, or content. Incidentally, whiskers pointing completely forward while every body hair of the cat is standing on end means the cat is startled or excited. Pulled all the way back and the cat is angry or defensive and probably in clawing mode! A cat’s whiskers adds to its feeing secure and are part of a cat’s mobility. Without whiskers cats become basically disabled and are unable to call up its acrobatic and physical feats which allow them to avoid dangerous situations, which in their world is comprehensively catastrophic!